Scene of the Blog Featuring Heather of Capricious Reader! Check it out! 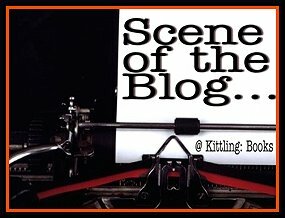 This week marks the beginning of the third year for Scene of the Blog, and of course that means a brand-new graphic. Can you believe it? Three years. Who'da thunk it? And I couldn't do a bit of it without all you fellow book bloggers. Thank you! This is my desk with my ancient PC on it where all the blogging goes on. I really, really wish I had taken a before picture, because my old desk was a Mess. It was such a Mess, that it took on its own name, its own face, its own personality! The Mess did not want to leave – and it keeps trying to come back - but I think I have finally kicked it out with the trash and this lovely, lovely desk is what I have been left with. 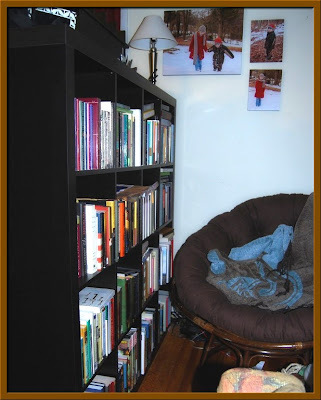 …is my own personal, private, QUIET reading space. My extra fluffy comfy papasan chair with my warm, fuzzy extra cuddly blanket, make for an amazing reading nook for me. On one side are my beautiful books and on the other is the window where I can get light during the day. The only thing missing is a floor lamp, since our kitty Jasper decided to break that over Christmas. I’ll be getting a new one very soon. I spend a lot of time here after the kiddos go to bed. The whole family when down to IKEA and I picked my new desk out. The big selling point? THE SHELVES. The gorgeous, gorgeous shelves! I didn’t get all my books on here, maybe about half, but wow, do they look beautiful. Don't forget that on the other side of these shelves is Heather's brand-new desk. I love the coziness of the space and the photos on the wall above her chair. I noticed in the other photo that there seems to be a fireplace close to the chair, and I'm wondering if it's a working fireplace? This set-up reminds me so much of how I had my room set up during college. I didn't have much space, but I used a very tall bookcase unit to divide the space in two. I put my desk at right angles to the bookcase, and voilà! I had one clearly defined study/ writing area which gave privacy to the sleeping area on the other side. In many ways I miss that room, so I was happy to see how much Heather's comfortable space reminded me of it. Thank you so very much, Heather, for allowing us this glimpse into your creative space. I, for one, give it two very enthusiastic thumbs up! Please don't forget to stop by next Wednesday when another member of the book blogging community will allow us into The Intersanctum! That's a lovely place for blogging and reading. I wish I had my own cozy reading chair. Hey Heather, now that you have your Mess conquered, think you can come do battle with mine? What a lovely, cozy spot to curl up!!! 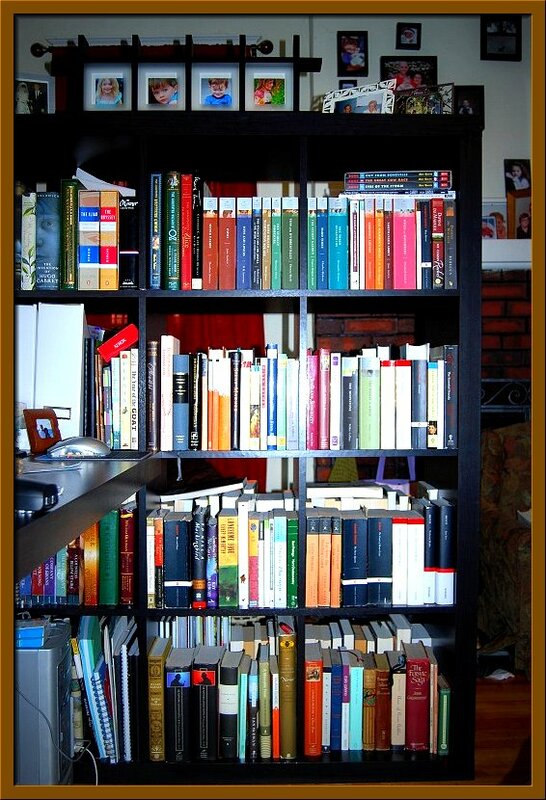 Nice shelves - I like the proximity to your desk! That is a really fantastic desk - I love all the shelves!! Such a beautiful space. Heather, you have such a nice space for reading and blogging! I love the desk and comfy chair, and must say that your shelves look amazing as well! I love it! It looks nice and cozy. don't you just love Ikea! Those shelves and that desk are awesome! I'm so glad you have your own reading nook in the space too...that's just two of the best rooms in one. Thanks for sharing...and I too want to know...is that a working fireplace? 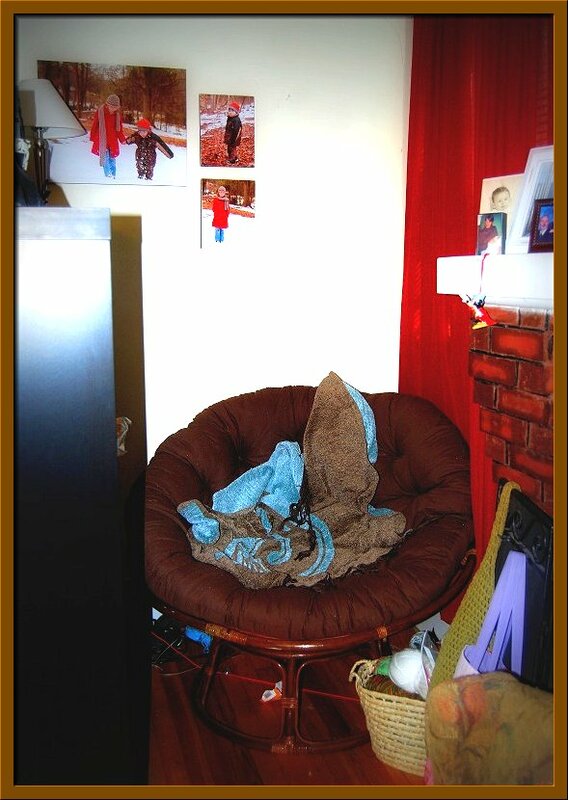 I know where Mess went - my study! Seriously, you are welcome to have it back. Lovely blogging and reading area. Hope you get a nice new lamp soon. Thank you everybody! I am totally in love with my new space! Serena, I adore Ikea! How did I live without it! I'm ready to go again! Oh and, no, it's not a working fireplace, but we have entertained the idea of putting in gas logs. It would make it all the more cozier! This is a great set up, Heather, so cozy! I guess your computer might be ancient but your screen is awesome! I also love your papasan pouf chair (I had one in college and it was so comfortable) and those great Ikea bookshelves! I want to come look through Heather's shelves. I also want to meet her at IKEA one day. Ah, new shelves! I´d love some, but my husband is giving me tickets for CrimeFest in Britain in May instead, and a woman can´t have everything, can she? Amy, that's a new monitor! The other one went BOOM! lol And I loooove my papasan chair. It is so very cozy! Kathy, I want to meet you there too! We would have so much fun! Dorte, as much as I love my shelves, I think I would take a trip to Britain over them any day! Lucky you! 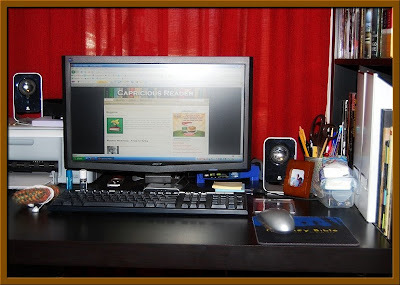 Thanks for sharing another bloggers space, always fun to see. Beautiful! I love love love your setup! Sorry to be so late in visiting this week. I love Heather's blog adn I love, love, love her blogging space. Wow! wow - 3 years? I can't believe it's been that long, congrats! I love Heather's wide screen monitor..that's what I have at home and I love it. Nice new graphic! Congrats on three years, Cathy. 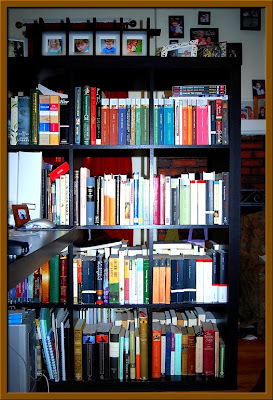 Heather, I'm envious of your IKEA bookcases! A new store will be opening in Denver this year, and you can bet that a bookcase (or two? )is what I'll be looking for right away! !